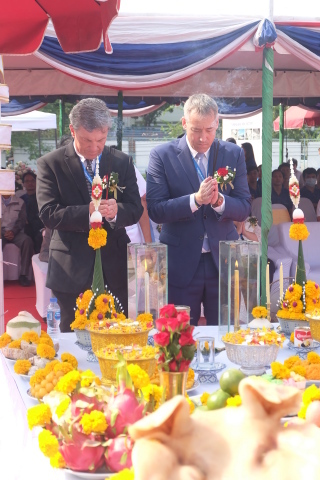 TurbineAero announced today the groundbreaking ceremony for a new building in the Free Zone of the AMATA CITY Industrial Estate, Chonburi, Thailand, outside of Bangkok; and a new executive, Robert Wilson, joins TurbineAero as the new Chief Executive Officer. Headquartered in Chandler, Arizona, USA, TurbineAero is one of the world’s leading independent aerospace component maintenance, repair and overhaul (MRO) service providers focused on auxiliary power units (APUs) and related products. The 80,000-square-foot new facility will house up to 250 employees and will handle high technological testing, maintenance, repair and overhaul activities for aircraft components and systems for our worldwide customers, including APU MRO, LRUs and APU part repair. Along with the new building, Robert Wilson was announced as the new Chief Executive Officer (CEO) for TurbineAero, Inc. Prior to becoming CEO of TurbineAero, Robert founded Aerospace Advisory Group, LLC in 2014, and served leading aerospace companies in consulting and board roles. Rob served 27 years in leadership roles at Honeywell, and predecessor companies, supporting commercial airlines, military and business aviation customers. He served the last 9 years of his 27-year Honeywell career as the President of the Business & General Aviation business. “I am honored and excited to be leading TurbineAero’s global team of APU specialists, as we enter an exciting phase of our continued growth. We are pleased to take this key step in building a world-class facility for our experienced TurbineAero Thailand team to provide superior APU MRO services to current and future customers in the region,” said Robert Wilson. TurbineAero is the leading APU MRO service provider of comprehensive, flexible and reliable solutions to the global aerospace community. As the largest independent APU MRO globally, TurbineAero repairs, sells, leases, tests, and certifies APU and related parts accessories. TurbineAero currently has four locations, three business units are located near Phoenix, AZ, and the fourth is just outside of Bangkok, Thailand. For more information, please visit www.turbineaero.com.